This is a 2005 interview with the legendary comedian -- who got her start at the Purple Onion in the city. The legendary comedian -- who paved the way for so many female comedians -- died this week at the age of 95. “Our dog died from licking our wedding picture,” cackled the comedian, who described herself as looking like a lampshade in a whorehouse . 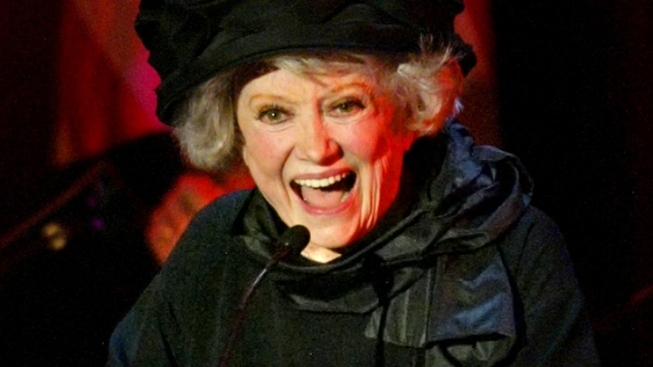 Phyllis Diller spent half a century on the stand-up stage, knocking her own looks, cooking, parenting skills and wifely duties for the fictional Fang. She shoved her way into the boys’ club—leaving the door open for future female comics such as Joan Rivers, Roseanne Barr and, lately, Amy Schumer. Diller kicked off her long career in San Francisco, at the famed Purple Onion, where she performed for a record-breaking 87 weeks in a row. Corey Andrew: First, let me say, I’ve been a fan since I saw you on ‘Scooby-Doo,’ when I was a kid. Phyllis Diller: (trademark laugh) I love that show. I love that dog. If there’s anything I love, it’s a coward dog! Corey: Putting your autobiography together must have been a task. How did you jump into the project? Phyllis: I put it off all these years. People were constantly saying—you know how they say—‘You’ve got to write a book. Write a book.’ I had so many offers that I grabbed one of them. Corey: Was it bizarre going that far back? Phyllis: Painful. Painful. Damn, how’d I live through that (laughs)? Corey: How did this documentary come to be—that chronicled your stand-up career and last performance? Phyllis: Oh, that? This young man, Gregg Barson, this is his first production, the documentary of my final show in Las Vegas. It won first prize at the San Diego Film Festival. Phyllis: Yeah, I like that. Corey: You’re still quite stunning. You have made a lot of jokes over the years about your appearance, but you look very gorgeous. Phyllis: I dress well and always have. The jokey dressing was for stage only. I’m into fashion; I love fashion. In fact, I spend far too much on clothes. I never had any clothes as a kid. And what I did have were homemade. Corey: Now how many closets do you have filled? Phyllis: I have two huge rooms jammed with clothing. Corey: How often do you go through there? Phyllis: It’s like shopping. Every time I get dressed, it’s like going through a huge store and shopping. I love it. Corey: Are the clothes in the same room as the wigs? Phyllis: There’s two different rooms, one of the racks of clothing is in the wig room, because of course, they’re on the walls—veiled—on heads on the surfaces. The other is the wardrobe right off my bedroom, which is my working, everyday wardrobe. Corey: What kind of reaction do you get when people see the wig room? Phyllis: They can’t believe the wig room (laughs). When you walk into a room where there’s nails all over the walls and a wig on every nail, you’re gonna have a reaction. A lot of people sneeze (laughs)! And then others just beg to get out. Then I have another whole closet that is the boa closet. All boas—feather boas in every color that there is. Corey: I wore a rainbow-colored boa for Mardi Gras this year, and those things keep in the heat. Phyllis: Listen, there’s nothing warmer than feathers. I never, ever have pitied a bird in the rain. I’ve worn so many feathers. They’re hotter than fur. And they’re moisture repellent. Did you know that? Corey: They must be for the birds. Phyllis: Well, think about the swans and ducks swimming around in the water. Corey: What are your plans for the collection? Do you plan to donate them to a museum someday? Phyllis: I have already donated a display to the Smithsonian Institute in Washington, D.C. They have my joke file and my symphony outfit and the dress I wore in Vietnam with Bob Hope. Corey: You gave them your joke file? Phyllis: Yes I did. It’s an old-fashioned joke file. It’s on those little 3-by-5 index cards. Nowadays it would be on a computer. I still, here at home, have books with all those jokes in them. Corey: I think a lot was made when you decided to retire officially from stand-up. We hear a lot of people say they’re going to retire. Phyllis: I know, like Cher. If you don’t really do it, it’s like those cheap fire sales. You have a fire sale, but no fire. I’m not that kind. Corey: Why did you pick that particular time to say this is it, this is the last show? Phyllis: Actually because I was physically unable to deliver at the level I wanted to. And people don’t realize that doing an hour of stand-up is a big workout. And at my age, I wanted to go out at the top. Corey: Right, you didn’t want people talking behind your back saying you should have done it sooner. Phyllis: I couldn’t handle that. Corey: Before you started doing this, way, way back when, did you use the self-deprecating humor to get laughs? Phyllis: You talk about way, way back when, just yesterday here in Los Angeles, our mayor did a proclamation declaring it Phyllis Diller Day, because it was my 50th anniversary in show business. Phyllis: And I was so thrilled, and now I forgot the question (laughs)! Corey: Before the 50 years, did you use that type of humor about yourself? Phyllis: Oh, the self-deprecating humor, yes. I was so ugly as a teenager. You know a lot of teenagers go through an ugly period, and I went through a double-ugly period, and I handled it with humor. I made fun of myself before they could do it, so everything was swell—putting me way above whatever they were gonna gouge me with. Corey: That’s definitely a lesson kids could take today with so much pressure about beauty. Phyllis: I know, and they have to have the latest thing. They have to have the $100 shoes—whether their family can afford it or not. Corey: When you have something like that happen in Los Angeles—the 50 years—does it make you go back? Did you chronicle something for each of the 50 years—a stand-out moment? Phyllis: I never kept a diary because I didn’t have time—too busy packing and unpacking and traveling and looking for new jokes. But yesterday, I was going through a pile of postcards—oh, my God—from places I’ve been. I’ve been everywhere. It was lots of fun. Each place reminded me of something funny. Corey: Something else I’ve enjoyed watching and they’ve started to become popular again are the roasts. Phyllis: Oh, those. I have all of those. Those were fun. Corey: How did you prepare for something like that? Did you enjoy doing them? Phyllis: They weren’t prepared; they were all ad-libbed, and that was real booze. Corey: What about when you would get roasted? Did you like being on the other end of the delivery? Phyllis: I’m not really good at roasting. I’d rather be roasted. Corey: Do you follow female stand-up comedians? Phyllis: Oh yes, I’m crazy about those girls. Wendy Liebman is one of my favorites. Rita Rudner is another one. Corey: What kind of tributes have these women paid to you over the years? You must have heard from a lot of them. Phyllis: Oh yes, Roseanne gives me so much credit. Corey: When did you realize exactly what it was that you had done? Phyllis: I opened the door for women because, guess what, there is nothing harder than being a stand-up comic. I’ll tell you who started out trying to be one and never made it, the guy who was ‘Seinfeld’s’ producer. Phyllis: Larry David, he was a failed stand-up. That’s how tough it is. An awful lot of people have failed but have gone on to have wonderful careers. But it’s the hardest part of show business. Makes me feel tough, Corey. Corey: Back when you first started, do you remember the guys that were good to you? I’m sure there was a lot of resistance. Phyllis: Yes, there was resistance, especially from other comics. But the two major people who helped me were Jack Parr and Bob Hope. Phyllis: I did. I did. And that let to ‘The Ed Sullivan Show,’ and he was a fan. Corey: What was it? Did they think that women shouldn’t be doing stand-up; didn’t think you were funny? Phyllis: The fellow comics. Hell, they didn’t want me in their arena. Corey: It definitely seems like a very competitive business. Phyllis: It is, but it doesn’t need to be. There’s room for everybody. Corey was a writer and performer with Midwest sketch troupe, The NonProphets, before moving to the Bay Area with his family a few years ago. If you have ideas for future columns about comedy, you can send them to coreywrites@yahoo.com and follow him at twitter.com/coreywrites.